CTADS respondents were asked to rate their own health. 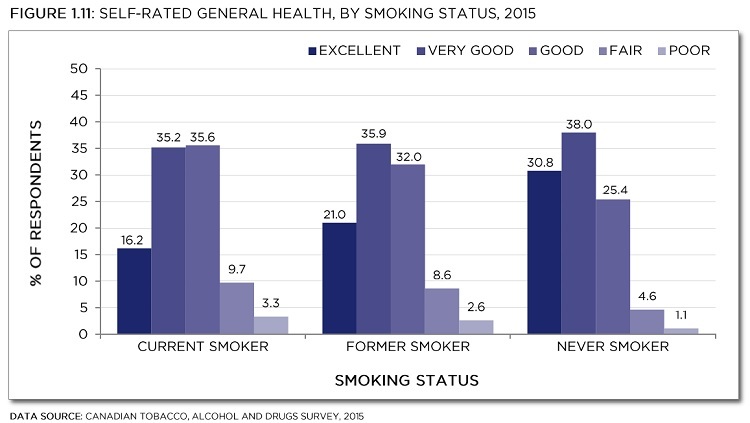 As shown in Figure 1.11 (below), self-rated health varied significantly by smoking status:19 only around half (51%a) of current smokers reported “excellent” or “very good” health, compared to 57%b of former smokers and 69%c of never smokers. The same pattern was observed among both males and females, with little variation from the overall estimates shown above in Figure 1.11 (data not shown). 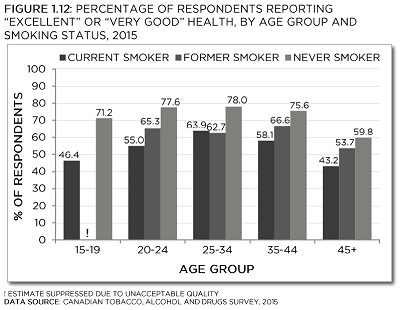 Self-rated health varied by age; however, within each age group, a significantly lower proportion of current smokers reported “excellent” or “very good” health, compared to non-smokers.20-24 (Figure 1.12).